Much like "The Cask of Amontillado," "Hop-Frog" is, at his heart, about the nature of revenge; in this case, the vengeful subject is the king's favorite jester, a dwarf named Hop-frog. The king invites Hop-Frog and his closest friend, a fellow dwarf named Tripetta, over and forces Hop-Frog to drink wine, even though the narrator notes that Hop-Frog was not a fan of drinking because it "excited the poor cripple almost to madness." Triepetta tries to stop the king, but he cruelly pushes her down and throws wine in her face. Hop-Frog is enraged, but, rather than showing his anger, he plays a prank of his own on the king. He convinces the king and his cabinet to dress like "Ourang-Outangs," which he says will scare the women. 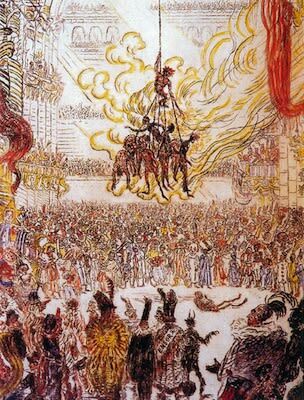 They agree, and the dwarf parades them, chained together, at the masquerade ball, and proceeds to set them all on fire in front of the crowd. Poe closes his bloody midget revenge story with these brilliant last words: “This is my last jest.” Seriously, what more could you want?